I only have one bottle of black ink in my possession and this is it. I’m not a big fan of black ink. In fact, I just about never use it, but I purchased this bottle for two reasons: 1) I think everyone should have at least on bottle of black ink and 2) It was less than $5. What’s interesting is that I actually kinda like this ink. It’s dryish without feeling the part, its got some decent water resistance, and it works well with dip pens. Decent flow and lubrication, but it is a bit on the dry side. Very little shading. This isn’t the blackest of black inks, but it is plenty dark. All in all, not a bad way to spend $5! 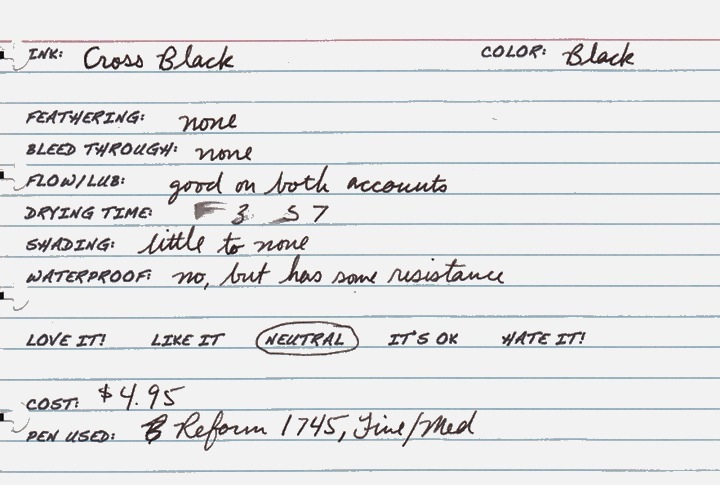 Note: Cross Black is the same as Pelikan Brilliant Black. Just a thing, Cross Black happens to be the same as Pelikan 4001 Brilliant Black! That’s two ink reviews for the price of one! Is it true that Cross ink is made by Pelikan?